How to register for Elements ? 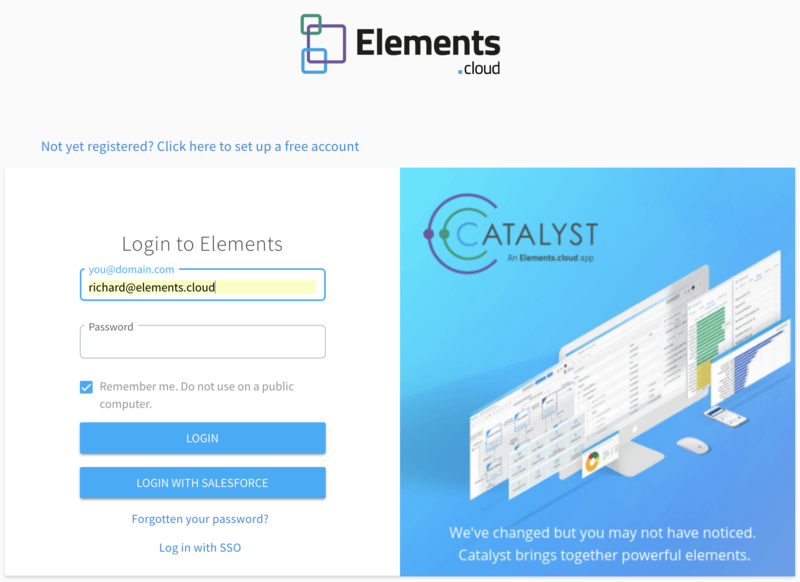 When you register to use the Elements app you need to provide an email, which will be your user name, and a password. After you register you will be taken to a screen that explains what happens next, and will be sent an email to verify your email address. Note 1 : ‘Login with Salesforce’ only works once you have implemented the Salesforce Managed Package. This is free and available on the AppExchange. Note 2 : You can upgrade to the paid for Pro capabilities allow you to use the full Catalyst capabilities to clean up, document and build better Salesforce Orgs. Note 3 : Login with SSO is part of the 'Corporate Management' capability. If you have installed the Salesforce Integration managed package, and the admin has provisioned users from Salesforce, all Salesforce users should be able to access any embedded Elements content without leaving Salesforce.